A Texan band in Berlin. 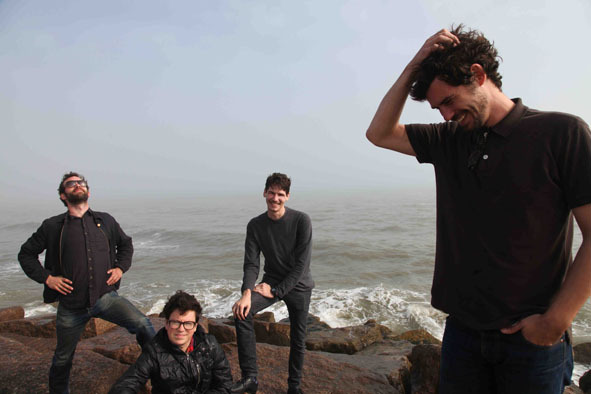 This could be the basis for a B-movie, but last week, this is exactly what went down, when Austin-based White Denim headlined Berlin’s Magnet Club on tour in support of its new album(s). Since its formation half a decade ago, White Denim has been operating at maximum capacity, releasing an album (or two) a year. The band’s most recent full-length, “D,” was released earlier this year. But although it was the fourth studio full-length White Denim made, “D” was actually the fifth album the band has released. Taking a break from the label game, the band – which had just changed from a three-piece to a four-piece with the addition of guitarist Austin Jenkins – spent last summer recording “Last Day of Summer” at drummer Josh Block’s home. This is because “Last Day of Summer” wasn’t recorded at a professional studio. Instead, the album was self-produced and self-released, and offered for free download on the White Denim website. All the members contribute to writing their parts of a song, and with rare exception, singer and guitarist James Petralli pens all the words. Still, the other members don’t feel any disconnect with what he writes. Terebecki agreed, noting that while the personal nature of some lyrics might not always resonate with the other members, the other three still hold Petralli’s writing in high regard. “Even the really personal songs [are] good enough where even if it might be sort of corny, it means something to [Petralli] and you can’t really take that away from him,” he said. As to whether or not the content of the songs can emotionally effect the other members, both Jenkins and Terebecki said it depends on a variety of factors, but typically, that they respond to different things. Jenkins agreed, but added that at different times, songs mean different things to him, and more often than not, they are influenced by the way in which Petralli performs them. It’s that attention to detail and to one another that contributes to White Denim’s success – while playing the music live demands a lot from each member, they all realize the important of remaining in tune with one another, both on stage and off. This synchronicity is also apparent in the interpersonal dynamic between the four, who admit they are more likely to argue about whether 311 or Sublime is better than to bicker with one another over matters directly concerning the band. Part of that decision-making process also entails who the band wants to work with on a business level. “[We are interested in] people who have a forward-thinking idea but are still grounded in what’s going on,” Jenkins said, explaining how sharing a similar vision is of the utmost importance, when it comes to the business side of things. But business matters aside, what it eventually comes down to is how much fun the four have touring and playing the music. Jenkins agreed, but specified that he can’t fully recognize the value of the traveling without experiencing the other facets of being in a band as well. This entry was posted in Interview and tagged American, Feature, Interview, White Denim. Bookmark the permalink.